Sanskriti 2018 is the 2 day, fun-filled, high energy, annual cultural festival of Tula’s Institute. It is a platform for Tulaites and students from other colleges to showcase their talent across different areas. Duration of the dance performance should not exceed more than 4 minutes. Participants have to bring their own audio track in Pen Drive. Participants can use a prop in their dance performance if they want it is not a judging criterion. A participant will be disqualified if he/she exceeds the time limit. All the participants have to bring their college/school identity card. The preliminary round will be on 20th April 2018. All the participants must report at the institute reception at 9 AM sharp. Duration of the dance performance should not exceed 5 minutes. There should be minimum 3 and maximum 10 members in a team. There will be 2 rounds – Preliminary and Stage Performance. 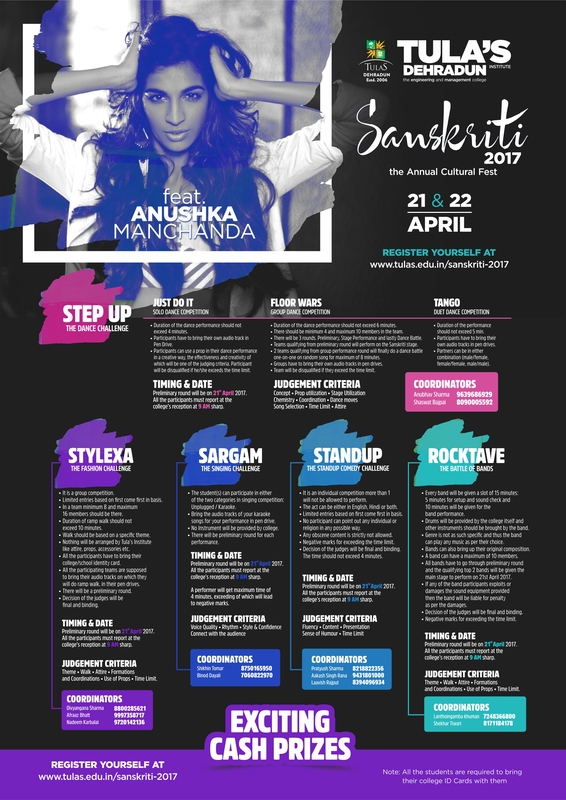 Teams qualifying from the preliminary round will perform on the Sanskriti stage. Groups have to bring their own audio tracks in pen drives. A team will be disqualified if they exceed the time limit. Participants have to bring their own audio tracks in pen drives. Partners can be in either combination (male/female, female/female, male/male). It is a group competition. Limited entries based on first come first serve basis. In a team minimum, 8 and maximum 16 members should be there. Duration of ramp walk should not exceed 15 minutes. Ramp walk should be based on a specific theme. Nothing will be arranged by Tula’s Institute like attire, props, accessories etc. There will be a preliminary round. The student(s) can participate in either of the two categories in singing competition: Unplugged / Karaoke. Bring the audio tracks of your karaoke songs for your performance in pen drive. No Instrument will be provided by the Institute. There will be preliminary round for each performance. All the participants must report at the college’s reception at 9 AM sharp. Performer will get maximum time of 4 minutes, exceeding which will lead to disqualification. The act can be either in English, Hindi or both. No participant can point out any individual or religion in any possible way. Any obscene content is strictly not allowed. Negative marks for exceeding the time limit. The time should not exceed more than 4 minutes. All the participants have to bring their college/school identity card. card. All the participants must report at the Institute’s reception at 9 AM sharp. Every band will be given a slot of 15 minutes – 5 minutes for setup and sound check and 10 minutes will be given for the band performance. Drums will be provided by the college itself and other instruments should be brought by the band. Genre is not specific and thus the band can play any music as per their choice. Bands can also perform their original composition. A band can have a maximum of 10 members. All bands have to go through preliminary round on 20th April 2018 and the qualifying 2 bands will be given the main stage to perform on 21 st April 2018. If any of the band participants exploits or damages the sound equipment provided then the band will be liable for penalty as per the damages. Click here to download e-Manual for further details and rules of the various event categories.